The latest combination of Pro-Target pistol features a Hawke Red Dot pistol scope and mounts. 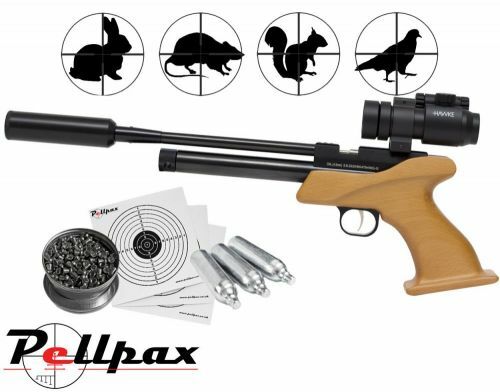 To complement this ProShot have also added a moderator and adaptor to reduce the muzzle noise making this pistol extremely effective at pest control and target shooting in your garden. To complete the kit you also get a large pistol case for safe storage, 10 x Co2 capsules, targets and a tin of ProShot pellets to get you going straight out of the box. Add this item to your basket & spend an extra £380.01 to apply for finance.